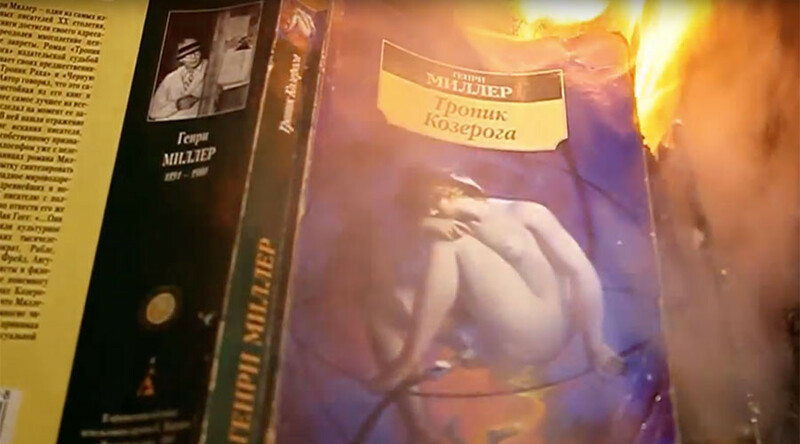 A group of young people in Krasnodar, southern Russia, burned several books written by American author Henry Miller and filmed the whole “ritual” on camera. The group slammed Miller for promoting an “amoral” western way of life. The YouTube video of what happened shows half-naked men hopping around the fire, dancing and throwing Miller’s books into the flames. Their men’s faces cannot be seen. The group describe themselves as members of a club of pagan librarians Perun (in Slavic mythology Perun is the highest god of the pantheon and the god of thunder and lightning). According to the group, Miller’s books are a representation of a western world which is vicious and lacks any kind of values. “Henry Miller’s works are an archetype of a morally decaying western world with its prevalence of fornication and its decline of family values,” activists wrote in their press-release published by a local newspaper Ugopolis. The young men said their goal was to secretly “correct” works of literature, Mir 24 reported. The group added that sometimes it was just enough to get rid of a couple of pages to turn a “harmful” book into a “decent” one. However, Miller’s works of literature are not the case here, they pointed out, saying it was absolutely impossible to “edit” them. The activists claimed the books had been taken from local libraries and archives. They also said only an insignificant number of books remained in the libraries, which is an “indication of the society’s moral health and consciousness". However, authorities denied the allegation, saying the books in the video did not bear any signs of having been in a library. “Through our campaign we want to remind society that literature is not harmless. We have destroyed a considerable amount of books, those books that cannot be useful for our society,” the group told Mir 24 TV channel. The "pagan librarians" also said that they are currently working on a “virus” that would comb the texts on web-portals, cloud storages, and maybe in networked computers for any amoral utterances and immediately delete the text if such were found. Some commentators questioned the men’s motives, saying the whole move could be quite the opposite of what it looked like and could in fact be a PR-stunt by Miller lovers to draw attention to his books.